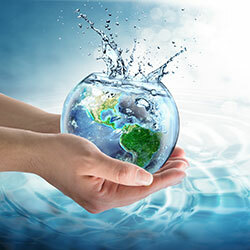 Each year during the month of April, cities across the United States take part in the annual Wyland National Mayor’s Challenge for Water Conservation. With no cost to cities or taxpayers, the Mayor’s Challenge offers a unique and compelling way to motivate residents to conserve water. Residents participate on behalf of their city by completing a series of online conservation pledges at www.mywaterpledge.com that encourage positive behavior changes. Cities that collect the most pledges within their population category win the title of most water-wise city in the nation. There is one national winner selected each year for the following five population categories: 5000-29,999, 30k-99,999, 100k-299,999, 300k-599,999, and 600k+. Contest winners are typically announced by the Wyland Foundation each May. As an added incentive for Orange County cities, the Municipal Water District of Orange County (MWDOC) and the Wyland Foundation partnered together to award a professionally designed water-efficient pocket park to one lucky city within MWDOC’s service area with the most pledges received by their citizens. The pocket park award serves as a community model for water efficient landscaping, and uses a variety of techniques and strategies that support sustainable water use. Special thanks to National Presenting Partner Toyota – in association with the Toro Company – for their continued support of the Wyland’s National Mayor’s Challenge and Orange County breakaway competition! California has a diverse selection of flora. Desert, forest, and island regions across the state have adapted to California’s climate, poor soils, and low rainfall. A water-wise demonstration garden that is easily accessible to the public, serves as a community model for efficient landscaping by allowing visitors to learn more about practical water-saving irrigation techniques (regardless of plant selection), and California Friendly plant options. Visitors can also learn more about the appropriate use of permeable surfaces, as well as the benefits of rain gardens and infiltration pits. These techniques allow rainwater to be filtered into the landscape and replenish groundwater, and simultaneously prevents excessive run off and pollution that affect our water ways and oceans. In 2018, the City of Westminster won both the National Challenge for their population category and the Orange County breakaway contest This was the second year in a row since the partnership’s inception, that an Orange County city has won the National Challenge. MWDOC, Wyland Foundation, Saddleback College, and City staff are currently working to select a location for the park. After this step has been completed, the design process will begin. City staff is motivated to complete the park in 2019. Stay tuned! In 2017, the City of Laguna Beach won both the National Challenge for their population category and the Orange County breakaway contest. After months of review and discussion, a location for the park was selected. 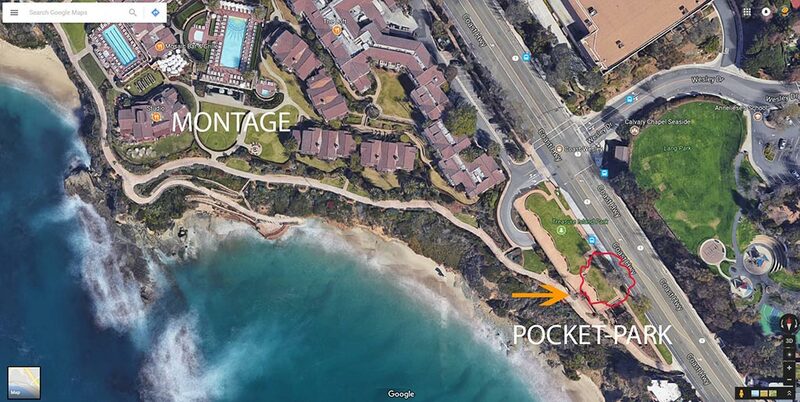 The location site, Treasure Island Park, off of Pacific Coast Highway and Wesley Drive in Laguna Beach, is owned and maintained by the Montage Resort. Three independent designs featuring an array of technologies available to capture dew and fog, have been developed by students in the Horticulture and Landscape Design department at Saddleback College. The dew and fog catchment system would supply most, if not all, of the water needed to maintain the park. In December 2017, the design team was awarded a $10k grant by the Metropolitan Water District of Southern California under their World Water Forum Grant program. Additionally, the students have also been presented with the Irving Sarnoff Award for their outstanding design concept. Currently, the Pocket Park project is in its finally approval stage. Project managers hope to break ground in the spring of 2019, and have the project completed by May 2019. Take the pledge today and help your city win BIG! www.mywaterpledge.com.